Anderson Cooper, who always seems to be searching for a disaster, probably should have been in Buffalo a few weeks ago for the October Surprise. 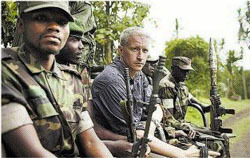 Fresh from Tuesday night's election coverage, the CNN anchor of the 10 p.m. weeknight program with the high-tech name, "Anderson Cooper 360," is scheduled to be at the University at Buffalo at 8 p.m. Saturday as part of its Distinguished Speaker's program. Cooper has distinguished himself covering hurricanes, elections, wars, famines and tsunamis. His work has added to a resume that already was full enough for him to write a best-selling book, "Dispatches from the Edge: A Memoir of War, Disasters and Survival," before he turned 40. The 39-year-old son of heiress and famed designer Gloria Vanderbilt, Cooper has already had multiple careers as a child model, reality show host and newsman. A very busy man, the Yale graduate paused for about 15 minutes to discuss his views of the news business and less serious subjects like his prematurely gray hair, his modeling career and his CNN colleague, Wolf Blitzer. How many colleges do you speak at, and why did you decide to take this gig? "I don't speak that often. It's hard for me to come up with a date and be able to stick to it. Often I end up canceling. But I really like speaking at colleges and universities so I thought I'd do it." Have you talked to Wolf Blitzer at all about Buffalo? "I haven't yet. But we're going to be together a lot on election week so he'll give me the scoop during commercial breaks or something." How would you describe the differences between the way you and Blitzer approach things? "He's a little bit more gray all over. He's got the beard going. I'm not quite that gray yet. I think we're both similar in that neither of us believes in wearing politics on our sleeve and (in) very much trying to just pursue facts and pursue information and talk to people of all sides and all different political beliefs and get people's opinions." A lot of people would say you are more of a crusader. "Given the bulk of stuff I do, I'm not advocating any cause. At times, I'm aggressive in trying to pursue facts and pursue stories in terms of shining a light on some places maybe that some people don't necessarily know about or haven't paid attention to. I was just in the Congo and Africa and Afghanistan. I'm a big believer in going to places and ... seeing what's happening and sending back reports about it. I think maybe that's what some people are referring to." I was thinking of your coverage of Katrina. "I think I was an advocate certainly for getting answers as to why relief efforts were as lacking as they were. I was certainly an advocate for informing people about what was going on and what I was seeing and what all of us were seeing and what people were experiencing. I don't have a particular strategy or political argument that I'm trying to make about an issue." What do you think of the "Saturday Night Live" parody of you? "I think it's very funny. The first time I saw it I was completely surprised by it and (it was a little) surreal. I'm a big believer in mocking myself or ... people poking fun at you." What was your view of the controversy revolving around CNN's decision to carry a video on your program of insurgents in Iraq targeting U.S. military personnel? "I certainly understand people's concern. This came about after a lengthy debate among all of us at CNN. I think there is a misconception. I think a lot of people who had opinions about it didn't actually see it and just sort of heard about it fourth hand. We did not show any American soldiers being killed. And no soldiers were identifiable. What this was, was a story about the increasing danger to U.S. troops of sniper attacks by insurgents." Has anyone actually confused Anderson Cooper 360 with ESPN 360? "There's like an Xbox 360 and I think ... there are a couple of 360s out there. I like to think we were the first. ... When the show started we were tossing around different ideas and someone suggested that, and I didn't have a better idea and we went with it." Was "The Mole," the ABC reality show you hosted in 2000, a good or bad thing for your career? "I had been doing news for like 10 years. I was working at ABC doing an overnight show and also worked at "20-20' and I really wanted a break from news. It was an interesting experience. Reality TV was in its infancy. But once 9/11 happened I wanted to get back into news and I was happy I was able to." Many people consider you a celebrity anchor. Do you tire of the title? "There are plenty of people in news who are far more well-known that I am. I have a nightly newscast. Beyond that, I don't know what it means." Is the gray hair an asset in your business at your age? "I find it odd that I have gray hair. ... It wouldn't be my choice." Do you remember anything about being a child model? "Not all that much. I remember wanting to do it because I was 11 years old and I wanted to earn money. And there are not many jobs an 11-year-old can get. So that was the job I was able to get." Do you get tired at all of answering questions about your famous mother? (He laughs.) "No. She's my mom, what can I do?"